I made a fun little card and bookmark gift set using the adorable Ellie Loves to Read along with the new Love to Read Stamp Set, The Bookmark/Tag Layered Die Set, and the Whimsy Star Layered Die Set! I just love the Dr. Seuss quote that comes with this set, and the font is fabulous! The sentiment I used on my card is also part of the Love to Read set and aren't the shapes of those star dies gorgeous! I ADORE the new layered die sets!!! The dp is My Mind's Eye The Sweetest Thing Lavender. Karen is also offering some amazing Hop Specials! There are several Bundle Deals, PLUS you get 15% off your order (Sept. 6-10) by using online code Sept15OFF! Make sure you take advantage of these great deals!!! Now it’s time to hop on over to Wendy's amazing blog, but before you go, don’t forget to leave me a comment for your chance to WIN! Happy Hopping! So beautiful card and tag,I love the image and the colours. Lovely card and bookmark. The butterfly looks great popped up and combined with all the pink it is 100% sweet! Great stamps, great card, great bookmark. Well done!! This is a super sweet set Kerri! Love the pretty papers and colors! 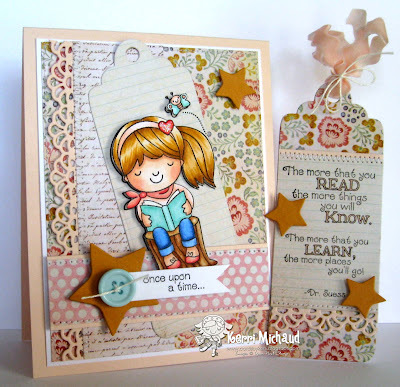 Ellie Loves to Read goes perfectly with all the new reading stamps and dies! Oh Wow, Kerri!! What a GORGEOUS set...love those papers and your layout is amazing!! This is absolutely gorgeous! I love everything about this set. your set is such an eye-candy! 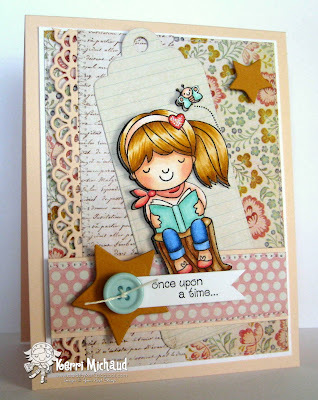 Very cute card...love how these bookmark dies look on it. Lovely projects. Ellie looks FANTASTIC, your coloring is just beautiful! Wow - I'm impressed with how nice her hair looks with your coloring. LOVE your set Kerri!!! Amazing work, as usual:)the colours are awesome! I love that these match to cute!! BEAUTIFUL colouring. Thanks for sharing! So pretty love it and the papers and the image is so cute. Great card and tag. What an adorable set! Love your coloring and how you used the new dies! Very cute Ellie card and matching bookmark. I like the stars and the paper. Great coloring on your bookmark and card. Love that reading is the message from the new stamp set. Thanks for sharing. Love the card and the matching bookmark! I love your card - bookmark combo. Stars are my big go to right now. Beautiful card and bookmark. So many beautiful details on both. So gorgeous, love these newbies!